The Zika Foundation presents a lecture and open Q&A on everything you need to know about ZIKA by the worlds foremost Zika and infectious diseases expert, Dr. Michael Callahan, MD, DTM&H, MSPH, moderated by Dr. Alan Altman, MD. The event was held on August 26, 2016 at the Chabad Jewish Community Center in Aspen, CO. This hour of America Abroad explores the response to Zika and America’s role in the global effort to fight infectious disease, compares Singapore to India in their efforts to eradicate mosquito-borne viruses and discusses what individuals can do to protect themselves against Zika. To listen to Dr. Michael Callahan's recommendations on how to prevent the spread of Zika, forward the interview to 43:30. The Zika Foundation and the College of Engineering at Texas A&M University hosted a rapid prototype design competition using an open-teaming innovation event using the highly successful Aggies Invent program format. The goal was to apply new discoveries about the Zika mosquito using trans-discipline expertise to halt the spread of the Zika virus through the rapid development and implementation of low-cost, sustainable solutions that have not been considered to date. Teams chose from one of three innovation tracks: Vector (mosquito) control, immune households, and community resiliency and sustainability. Innovate Against Zika took place the afternoon of Friday August 19 through Sunday, August 21 at the Texas A&M University’s Engineering Innovation Center, an open space where participants had access to state-of-the-art tools, equipment, material and support staff to develop their prototypes. Twelve participating teams presented their prototypes as well as solutions and implementation strategies on Sunday afternoon. SWATeam - Developed an app that engages young people in games to find mosquito areas, provides education and allows the community to learn more about Zika. Team comprised of 7 students from both Texas A&M University and University of Texas in Biomedical Sciences, College of Medicine, Chemical Engineering, Electrical Engineering and Economics. The Bucket List - Developed a Zika protection kit that is contained in a mosquito trap to form a multi-dimensional solution. Team comprised of 7 students from Texas A&M University in Biomedical Engineering, Biomedical Sciences and Nuclear Engineering (Pre-med). Persistent Pictogram - Developed an educational program with the use of pictograms on the do's and don'ts of mosquito rules that would be attached to the outside of rain barrels that would be distributed by NGOs. Team comprised of 7 students from Texas A&M University, East Carolina University and Wichita State University in Chemical Engineering, Biomedical Science, Biomedical Engineering, Strategic Communications, Biology and Chemistry. 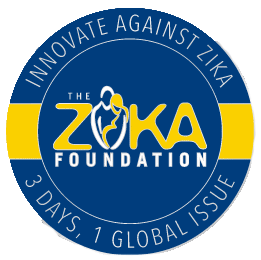 Over $4,000 in funds and challenge coins were awarded to all the participating teams for innovating against Zika. In addition, two top-performing students from both SWATeam and The Bucket List are traveling to Atlanta in the fall to present their teams' innovations to the CDC's Zika Incident Response Team. The Zika Foundation and Texas A&M College of Engineering know that the innovators and rapid-change makers of this world are able to address this pressing issue. We enjoyed the collaboration that took place with industry, government, clinical and faculty mentors and undergraduate and graduate student innovators from all disciplines, including Engineering, Entomology, Architecture, Public Health, Women's Health, Communications, Medicine, and Epidemiology. For more information on Innovate Against Zika, click here.